The straight-talking, bestselling author and Pitbull of Personal Development is back with a pithy and prescriptive guide to success. A five-time bestselling author and one of the country's leading business speakers, Larry has made a reputation for being the first to challenge the positive-attraction gurus and the law-of-attraction bozos with his commonsense approach to success. Larry doesn't sugar-coat, and he isn' t afraid to make people uncomfortable, because he wants us to stop making excuses, and start getting results. 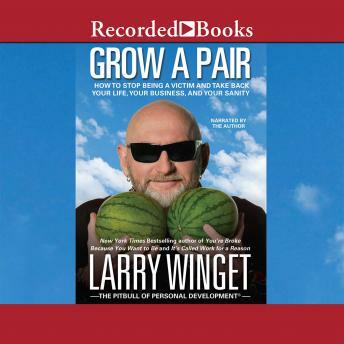 In Grow a Pair, Larry takes on entitlement culture, the self-help movement, political correctness, and more. We've all heard the phrase "grow a pair", but Larry's advice isn't about anatomy- it's about attitude. To get the success we want, we need to reject victimhood in favor of being assertive and finally taking some responsibility. With prescriptive advice on goal achieving, career, personal finance, and more, Grow a Pair will give the readers the kick in the pants they need.